In 2004, research by Richard Walling showed that the Bethel Indian Town mission of David and John Brainerd, the most important Delaware Indian (Lenape) site in New Jersey during the 18th century, was located at the headwaters of Wigwam Brook (and vicinity) in Monroe Township, Middlesex County, New Jersey. Ironically, the entire area was already preserved within county-owned Thompson Park, purchased with state Green Acres funds, and legally protected from development. 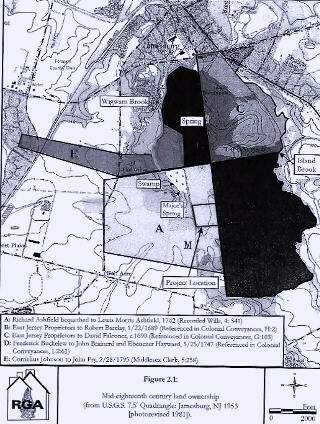 However, this site at the headwaters of Wigwam Brook was proposed as the location of a replacement high school for Monroe and as a result of this proposal, an archaeological assessment was begun in early 2007. After an initial summary of no significance, the New Jersey Historic Preservation Office required a Phase II Survey, which in fact, yielded a four acre-designated archaeological preserve which was separated from the thirty-five acre school expansion site. In spite of significant 18th century remains within this preserve, the consultant maintained that there was no historical proof that the Bethel Mission was at or even near to the high school site. Although admitting in its various reports that Bethel may be at the site, the consultant’s public position, with a fee to the township for nearly $1,000,000 for survey work and construction monitoring, was that Bethel was located on an 18 acre, heavily sloped ravine one-mile north of the school expansion site. Its conclusions relied heavily on misinterpreted Indian-associated references in a couple of land documents (ex., earlier deeds in the Manalapan River basis area) and a 1876 Centennial celebration speech given by a local history enthusiast who was a clerk at the Jamesburg (neighboring community) bank. By early 2008, the State Preservation Office and New Jersey Department of Environmental Protection gave full sanction to the de-accession of the land as a protected park. Ground breaking began immediately, only to be halted in June of 2008 when additional remains were found. The consultant identified these stone foundation remains as a 19th century farmstead, with no earlier association. Peer review of this assessment was never permitted and construction resumed. Newspaper articles at the time quoted local officials as stating, “no burials” were uncovered, as if burials were the only cultural feature of the Delaware people’s and American history worth worrying about. MONROE – The Bethel Mission is an important site worthy of preservation, according to three university professors who study the period before the American Revolution. However, none could pinpoint its exact location, though many believe it is in Thompson Park. The present-day location of the mission was called into question after the township and Middlesex County applied for a land swap in which the township would exchange 175 acres of undeveloped land for a 35-acre parcel of Thompson Park on which the Board of Education wants to build a 365,000-square-foot high school. Some say the high school is proposed to be built in an area that is too close to the site, which could compromise its historic value. Others say the mission is actually located near the Jamesburg Borough Hall. Jean Soderlund, deputy provost for faculty affairs at Lehigh University in Bethlehem, PA; Brooke Hunter, an assistant professor of history at Rider University who specializes in early American history; and Dr. Schutt all spoke to The Cranbury Press over the last two weeks about the mission’s history and historical significance. Dr. Soderlund has served at Lehigh as a professor of history, chairman of the history department and co-director of the Lawrence Henry Gipson Institute for Eighteenth Century Studies. Dr. Schutt has recently published a book entitled “Peoples of the River Valleys: The History of the Delaware Indians,” which focuses on the history of the Leni Lenape from 1609 to 1783. According to the three, the Bethel Mission got its start in May 1746 when the Rev. David Brainerd moved a number of Leni Lenape he had converted to Christianity from a settlement known as Crossweeksung, located in Burlington County, to a new settlement in Cranbury, which was called Bethel. The Rev. Brainerd was a Presbyterian missionary from Connecticut who traveled throughout New York, Pennsylvania and New Jersey preaching to Native Americans and trying to convert them to Christianity. He has been described as appearing unhealthy, feeble and weak. He was given to coughing fits and occasionally spit blood during his sermons because of a pulmonary condition, Dr. Hunter said. Dr. Soderlund said the Rev. Brainerd’s plan was to create a town that included a school and a church. The Rev. Brainerd died in 1747, but the town continued under the leadership of his brother, John Brainerd. However, the Bethel Indians became involved in the 1754 outbreak of the Seven Years’ War on the Pennsylvania frontier, which led to the town’s downfall. During that time, Colonial authorities required the Bethel Indians to wear a red ribbon on their head to prove they were friendly, Dr. Hunter said. In 1758, the Bethel Indians sold most of their land to the provincial government in return for a 3,000-acre reservation, known as the Brotherton Reservation, in central Burlington County, Dr. Soderlund said. She said it appears that many of the Bethel Indians did move to the Brotherton Reservation, of which John Brainerd became superintendent. However, he reported that 40 Indians remained in Cranbury in 1761. While all three professors said they did not know the exact site of the mission, they said it is an important site to preserve, because it is essential to understanding the lives of 18th –century Lenape Indians living in New Jersey. “Bethel was an important part of history that demonstrates the persistence of Native Americans well past the time when most historians have thought they moved west,” Dr. Soderlund said. Dr. Hunter agreed, adding that the site serves as a reminder of the various reactions the Native Americans had when approached by missionaries like the Rev. Brainerd. Dr. Schutt said the mission has further significance because it has links to another missionary, John Sergeant, who had a mission in Stockbridge and was working to convert the Mohican and Delaware Indians to Christianity. She said the Rev. Brainerd had worked at the Stockbridge mission prior to beginning his own preaching. Andy Stout, eastern regional director of the Archaeological Conservancy, agreed that the mission is a significant historical site and said his organization would have an interest in preserving it as a permanent research preserve. The conservancy is a nonprofit organization based in Albuquerque, N.M., that acquires and preserves archaeological sites. “(The mission is significant) just because of the fact that the (Leni) Lenape were there from 1746 to 1758 in significant numbers and in this interesting time period where they were being converted to Christianity and living more or less a Christian lifestyle,” he said. In addition to the foregoing, this author (Walling) reported the strong historical role that Bethel’s residents played during the critical years leading up to, and especially, during the French and Indian War (1755-1763), at a time when control of North America was being contested between France and England, with France in ascendancy for much of the time due to its Native American allies. Beginning in 1755 and throughout the war, men of Bethel were critical links as representatives between British colonial interests and Native American interests of the tribes living along the frontier of northern New Jersey, Pennsylvania, New York and the Ohio Country west of Fort Duquesne (present-day Pittsburgh). Jo Peepy, John Pumpshire, Jo Mickty, Isaac Stille, Thomas Store and Moses Tattamy were all Bethel residents who have been aptly described as cultural diplomats who secured the neutrality of the Susquehanna, Allegheny and Ohio Delaware Indian Diaspora communities. This association continued into the early years of the American Revolution when, in 1778, the Delaware Nation signed a treaty of alliance with the United States, offering military support to the young republic in its struggle against Britain and its native allies. These are all facts of America’s birth which are little known, and completely overlooked in the presentation of our Nation’s early history, and which would be exemplified by Bethel’s placement on the State and National Registers of Historic Places. The New Jersey Historic Preservation Office accepted the consultant’s conclusion that Bethel existed on an eighteen acre parcel on the slope of Wigwam Brook one-half mile away.. The Historic Preservation Office sought to be convinced in its requirements for the Phase I Survey that the issue of land ownership be completely addressed. This was due to the known association of Bethel Indian Town as being on the “Falconer Tract.,” a Scotsman who acquired land near Wigwam Brook and the Manalapan River in 1701. His land was bordered on the west by property owned prior to 1742 by Governor Lewis Morris of New York. * In historic preservation planning and implementation, an APE must include not only the on-site area of disturbance, but also any adjacent or ancillary impacts as well. In this instance, the APE should have included the lands adjacent to the area of disturbance as one important criteria of historic place recognition and protection is the quality of setting of the resource. The Bethel Indian Mission contained hundreds of acres of farmland. This setting, then preserved within Thompson Park, was never considered by the HPO in its review of the proposed land transfer from protected open space to development. The land assessment by the consultant then proceeds to describe the conveyances of these lands and tracts immediately north of them. This statement is an example of the misinterpretation of Indian-associated records. In fact, a 1741 deed between Andrew Wolle (Woolley, successor to famed Sachem Wequeheela) and Peter Tule, describes an old cart path that comes from South River (Manalapan) to the old Indian plantation. Note: This statement is contradicted by the location of a spring, known by the 1840s as Major’s Spring, just west of the APE, which were the headwaters of Wigwam Brook. On July 12, 2007, the consultant submitted a proposed Phase II archaeological survey work plan to the NJ HPO and it was approved within ONE DAY. Between July 17 and August 14, 2007, this additional work was done. During this Phase II, significant eighteenth-century remains were found (contrary to the June 2007 consultant addendum’s conclusions), and was recorded at the New Jersey State Museum as Thompson Park Historic Site (28-Mi-243) and described as potentially associated with Bethel Indian Town. In spite of this archaeological site, and its associated setting within the preserved open landscape of Thompson Park, the HPO continued its position of destruction of the remaining 31 acres of the APE. From the New Jersey State Archives series of newspaper abstracts, as referenced above by the consultant as having been thoroughly investigated, we find a newspaper advertisement dated October 4, 1765, Lewis Morris Ashfield, of Shrewsbury, lists the following for sale: A five hundred acre farm on the road from Freehold Courthouse to Princeton, near Cranberry at a place formerly known as the Indian Town [emphasis added]. It was sixteen miles from Brunswick and Amboy, ten miles from Princeton and four miles from Cranberry. Three hundred acres of cleared land, not tilled for many years and timber remarkably fine. This add was a repeat of an earlier one, dated April 4, 1765, for land located ten or twelve miles from Freehold on the road that leads thence to Cranberry and Princeton. Three hundred acres cleared, two hundred acres in timber; the cleared land many years kept mostly to grazing. To the Rev'd Mr. WHEELOCK. BROTHERTON, ON MOUNT CARMEL, September 14, 1761. The name of the elder child is Miriam Store. She is a very amiable child, and I have much reason to think was savingly converted when she was about three years old. Her life, however, has hitherto no way contradicted such a marvellous work as seemed then to be wrought upon her, of which I had the pleasure and satisfaction to be an eye-witness. I could not then determine what it was, but thought multitude of days would speak....Miriam will be twelve years old if she lives till December. I feel tenderly concerned for these little girls; and, as it is a very considerable thing for them to go so far from their parents and all their relations and acquaintances, I hope they will meet with the kindest and best treatment; and may Heaven succeed the design. And as of February, 2009, what now? The high school is under construction, and the Thompson Park Historic Site (28-Mi-243) has been set aside, but will it remain forever protected? A portion of the balance of the Ashfield tract remains preserved within the park as does virtually all of the Falconer south tract. This parkland is the site of archaeological remains. There were forty cabins, a church, a school, cemetery and hundreds of acres in crop and/or grazing, farm buildings, etc. Public officials have already allowed a portion of Bethel to be lost, now what will the future bring to the remaining historic site? Descendent tribes, nations and individuals of the many hundreds of Native Americans who lived and died here are entitled to have their voices heard and respected in terms of preserving and interpreting the site of Bethel Indian Town. It is also the policy of the United States and of New Jersey to protect and interpret such sites as our national heritage. The proponents of the school within the park have succeeded on many levels, not the least of which is the legacy of obliterating a portion of Bethel, and by use of any and all means possible. What will public officials do next, and who will ensure that path is the correct one? Two documents from the 1750s - 1760s relating to the specific location of Bethel Indian Town remain in the historical record. They are a letter from Rev. William Tennent of the Freehold Presbyterian Church, written in 1756, and an advertisement for land for sale by Lewis Morris Ashfield, dated 1765. These documents are from a broader set of primary sources which provide further historical evidence as to the location, description and significance of Bethel Indian Town, established in 1746 and extant until at least 1759. These two documents described were known to Richard Grubb & Associates, the consultant hired by Monroe Township, Middlesex County, New Jersey, to prove the lack of association of the Township’s new high school (APE) as the site of Bethel Indian Town. In two telephone conversations with Richard S. Walling, Philip Aldrich Hayden, Senior Historian at first disclaimed any knowledge of the 1765 land advertisement, but one week later (Feb. 18, 2009), admitted that he knew of the advertisement, but discounted it. He further stated that he knew of the Tennent letter of 1756, but discounted it because he deemed it referred to land situated in western Middlesex County, located between Cranbury Village and the Borough of Hightstown, twelve miles west of Tennent’s ministry (known today as Old Tennent Church, Manalapan Township, Monmouth County) and the subject of a prior 1753 land transaction. It is important to set Rev. Tennent’s letter in historical context. David Brainerd established Bethel Indian Town in the spring of 1746 as a successor mission to his work at Crosswicks. Within the year, he died and was succeeded by his younger brother, John Brainerd, who would remain associated with New Jersey American Indian mission efforts for nearly two more decades. In a letter for the general public written August 16, 1746, to attest the work of divine grace among the Indians, he .says, "As I live not far from the Indians, I have been much conversant with them, both at their own place, and in my own parish, where they generaly' convene for public worship in Mr. Brainerd's ab.sence, and I think it my duty to acknowledge, that their conversation, hath often, under God, refreshed my soul." Bethel was a community sustained by agriculture. A few months after the visit to the Freehold church, David Brainerd wrote: Friday, Oct. 24 . Spent the day in overseeing and directing my people about mending their fence, and securing their wheat. (The Life and Diary of the Rev. David Brainerd: With Notes and Reflections, by Jonathan Edwards) As a note of foreshadowing, please keep these references in mind when you review the 1765 advertisement by Lewis Morris Ashfield (below). Attention should be given to the phase in the August 16, 1746 letter, “brought a considerable number of the Indians in these parts.” The general public, and most historians of colonial New Jersey, have little understanding of the presence of American Indians in New Jersey at this period. From Moravian records, however, we know of a very visible Indian presence in central New Jersey during the early to mid-18th century. Examples include later Moravian converts, Augustus, Salamo, Teedyuscung, Joe Peepy, etc. Augustus (al. George Rex) was born in Kingston, New Jersey in 1716 and Salamo, al. Keposch, was born at nearby Rocky Hill in 1672. Teedyuscung was born near Trenton in about 1700, and dozens of other Moravian converts came from New Jersey south of the Raritan River. “Sept. 5.-Attended family and secret duties, and then took leave of my friends and came on my way. Went to visit a number of Indians as I passed along, and spent considerable time with them in prayer, singing, and conversation; visited also several Christian friends. Took leave of the Indians, etc., and came up to Justice Stockton's, at Princeton, with whom I tarried all night. [In November, 1760, Moses Tatamy lay dying at Edmund Bainbridge’s house on the Maidenhead (Lawrence Twp.) - Princeton boundary line. While there, he had met with Col. Andrew Johnston regarding some of Tatamy‘s land in New Jersey]. Major settlements in 1756 included, Cranberry [Bethel], Crosswicks, and Rancocus [al. Coaxen/Weepink]. In late 1755, Jersey Indians (and other natives) living on the Susquehanna and led by Teedyuscung, were raiding against the English for perceived wrongs. Once this blood feud was spent, he and his followers were quick to re-align themselves with the English and the colonial governments. The Treaty of Crosswicks, held in January 1756 is an official representation of that change of attitude. As it hes been ye Constant practis of my Reverend Brethren mesurs David, & John Brainard; to give an act of ye state of ye Indian Congregation under their Charge (at least annualy) for ye satisfaction of all concerned, with the means they used to promote God worke [am]ong them. in As much as as I have been intrusted with ye care of that society, for some time past; aprehending that something of that Kind may be (Reasonably,) expected of me, have drawn up ys General, & succinct narative. to return The School had been droped for some time, & ye Children neglected except by ye almost matchless pains of mr. Br. & after all (by his many avocations) cold not carry ym on in their Learning as other ways yy might be. nor had he freedom to imploy a master partly becaus yy were unsettled, & partly ye smalness of ye medium wc had to support on. But as ye Learning of ye children is of ye last importanct to ye spread christian knowing I ventured to erect ye scool under ye care of an Indian master [Stephen Calvin, see below], hopeing by ys means to have it continued at much less charge, as also to rais in ye Indians a Laudable emulation in Learning, by advanscing one of ye selfs to be master. Blessed be God I am not disappointed. The school is Regularily carried on; ye Children learn well I have weekly examined them & am Refreshed at their progress. morning & evening prayer is performed by ye master, & a due decorum preserved, tho we greatly need Catechisms & other bookes; there are between 15 & 20 ordinarily yt attend & sometimes more. I have according to my measure preached to ye congregation once evrey week ordinarily, & frequently oftener, as I can preach wt them in ye morning, & at my one church in ye afternoon; ye distance being as is computed between 7 & 8 mils. nor have I faild to discharge evrey part of ye Pastoral office as far as I am aquainted wt it, tho there has been alles and stil is in all great weaknesses, and many sinful infirmitys we need ye blood of X to cleans them. The Congregation is in poynt of number is rather larger yn wn mr Br left it some haveing returned who had left it & have declared yy cold not be easy in their hearts without ye preached word They are sincearly attached to ye inglish intrest & I doubt no wold be as free to venture their all id defense of it as any of his magestys subjects as is evident from ye declaration of one of them called Simon who listed in ye Provinsial troops ye last campain. being asked by me wh indused him to enlist he Replied yt he understood yt ye French had not only a designe to take our lands but to keep us from serveing Jesus as he wold have us. & furder aded yt as he had given himself to X soul & body he thought it his duty to fight for him. I asked him how he made out wt his felow soldiars? he answered he was more afraid of ym yn ye enemy yy were so wicked, for sd he yy drink yy sweare yy fight, & dont mind ye Sabath I again asked him wt he did about praying? he answered, tho he cold but seldom get alone yet he often yea when under arms lifted up his heart to Jesus X who gratiously mad his heart warm wt love to him. excuse this degression. Profesors among them are generaly regular in ye walke there has been two instances of misconduct that I know among ye members since I was concerned wt ye sosiety one yt was drinking to excess. & both have publiquely confesst in nay one of ye persons spoke so to ye congregation warning ym by his fall yt yr was floods of tears shed all over ye house he wa so afected himself that he was not able to speake for some time, & after he begun to speake was more yn once constrained to stop, & sob as if his heart wold breake, such was his sence of ye dishonour done to god. I wold to god yt amongst our selfs where more may be expected there was such preceiuse evidences of contrition. ye worshipe of god is carried on in yr familyes from house to house morning & evining they convean twice aweeke whey ye convers to gether about ye things of God pray to ye lord & sing his prayers exclusive of ye times of my being wt them & on Lord’s Day they meet 3 times to worship they read some portion of scripture & then alternately pray, & sing. it is to be feard yt some of them Joyn out of mear form & custom, tho I dout not others of ym worship ye lord, in spirit, & truth. yr conversation hes often ministerd matter of reproof, & quickening to my vain & sluggish heart, thus my lord has sent me to Reape yt on wc I bestowed no labour, others hes laboured & I am a partaker of ye fruit of yr toil, but god have all ye glory. Some I hope have got saveing benefit since I preached among them some have been brought under concern about their state some have been comforted. I have baptised 3 adults who gave charitable reason to hope they are sinceare To conclude tho I have had no small excercise on there act chiefly occasioned by some il minded people who have wikedly indeavourd to insence yr neighbors against them mearly becaus ye indians on ye frontears have commited many murders, yy sought to have these poor inocents cut off &.c. I say altho I have been il used (becaus I interposed in their behalf) in my Character yet ye Lord hes made my labours among ym sweet to my sould, so yt I have gon to instruct ym as a mother to feed ye child of her love & in heart bless ye lord yt he counts me worthy to either do or suffer [for] him. Rev. Tennent continued to watch over the mission on occasion during the remainder of the French and Indian War, at times when John Brainerd served as chaplain to the Jersey Blues, the colony’s Provincial regiment. By way of example is the following letter to Richard Peters, Secretary to Pennsylvania’s government. The subject of the communication was Stephen Calvin, one of several Bethel leaders who served as cultural go-betweens linking British interests with those of the many Delaware communities stretching from the Susquehanna to the Allegheny and to the Ohio region. Calvin was also the son-in-law of Sachem Weequehela (dec. 1727). The Bearer, Stephen Calvins, informs me that yourself & some other Gentlemen have urged him to undertake as Interpreter for your Province, & that he had given some Encouragement, if I approved of it. The Importance of the Affair has induced me to part with him at this time, judging him the best fitted of any I know. But can’t consent he should enter under any farther Obligations at present, lest the small Church to which is Interpreter & Schoolmaster be deprived of him, & he being removed from these means God has Blessed to his reformation, he in danger of losing his first Love, & so cease to be of equal use either to Church or State. Permit me to inform you that he is not out of Danger of drinking to excess. Let him not therefore be urged to drink any, if it is never offered him he will be well pleased.. He chuses to lodge in some retir’d place that he may be out of Temptations, being sensible of his weakness. You will excuse the Trouble of this, when you are assured it comes from a heart really desirous of success to the Convention. P.S. Please to favour me on the return of the Bearer with an account of his Carriage. As noted above, Mr. Hayden stated to me in a telephone conversation on February 18, 2009, he was aware of the March, 1756 Tennent letter and described the location of the property referenced as a tract of land sold in 1753 from a group of “Cranbury” Indians to Andrew Home on April 14, 1753 and recorded in Deed Book H-2, p. 127 on July 22, 1753. At the time of this transfer, John Brainerd described this transaction “as Some of our principal Indians have lately disposed of a great part of the land on which they live.“ (Life of Brainerd, Thomas Brainerd, 1865, p. 146). This was a parcel associated with the group generally known as the Cranbury Indians, related to Weequehela and his descendants. There is absolutely no reasoning which would link this Indian land sale as the site of Bethel Indian Town. The 1753 parcel of land was situated between Rocky Brook, just west of Hightstown, Mercer County, to Cranbury Brook, in the vicinity of Brainerd Lake in Cranbury Village (modern place names) and thence southwesterly to the Millstone and down the Millstone to the point of beginning (mouth of Rocky Brook). Mr. Hayden stated that the tract was “mapped” by Grubb & Associates, but that he did not know the dimension of the parcel. Based on deed research and mapping the description, it appears this parcel is well in excess of one square mile, which is six hundred and forty acres. This piece of information, however, is the lesser of the argument against Mr. Hayden’s interpretation. The more critical fact which demolishes Mr. Hayden’s argument is that Rev. Tennent made regular visits to Bethel, usually more than once a week. He rode between seven and eight miles to the mission village, and of course, the Indians had also visited his own church on at least one occasion back in 1746. Using Mapquest and Yahoo mapping services, the following facts are incontrovertible. From Tennent, New Jersey (site of Rev. Tennent’s ministry and home), to the area of Brainerd Lake in Cranbury is thirteen miles; to Hightstown, it is twelve miles. From Tennent, New Jersey to the site of the proposed Monroe Township High School (al. APE) is eight miles. In addition to Mr. Hayden’s omission of salient facts from Rev. Tennent’s letter, he also fails to comprehend or account for the status of Indian land transfers in colonial New Jersey, particularly at this time period. All land transfers from Indian possession had to be approved by the colonial government. The exception to this rule was in the mid 1750s when a small group of men, including Andrew Home and Andrew Johnston were granted special leave to make purchases from Indian sellers. The 1753 deed from the Cranbury Indians to Andrew Home was executed and recorded within a matter of a few months. Conversely, the deed from Robert Hunter Morris to Indian Isaac Still and Andrew Woolly (the successor to Sachem Weequehela) for lands along the Millstone River and Cranbury Brook was made on September 19, 1749, but not recorded until August 16, 1763 (A-3, p. 138). Interestingly, Thomas Story and Andrew Woolley were identified as being residents of New Brunswick (the outlying township, not the actual city). A cursory attempt to track specific land transfers is fraught with the danger of misapprehension, especially when many such “deeds” where never recorded and an untold number have not survived in the historic record (examples include Indian lands reserved to Thomas Story and Tatamy situated in the Raritan/South River basin). To reiterate, Bethel Indian Town was situated approximately eight miles from Rev. Tennent’s own church in present-day Manalapan, on a five hundred acre tract that was secured to the Indians. The particular legal instrument that “secured” the land is not known in the historical record, but the location cannot be disputed. In the consultant’s report of June, 2007 detailing the land transfers of property at and near the APE, the firm concluded that the construction site of the proposed high school (APE) was divided between two colonial owners; David Falconer of Scotland and Lewis Morris Ashfield of Shrewsbury, New Jersey. The consultant is definite in this conclusion, and even mentions the presence of a natural spring on the Ashfield tract. Freehold, upon the Road that leads thence to Cranbury, and Princetown; there is on said Place near 300 Acres clear’d, and in good Fence; about 200 Acres remarkably fine Timber, and the Land the best in all the Country, for Wheat or Grass; and as it has been for many years kept chiefly to grazing, would without doubt, turn out great Crops of Wheat; and may be conveniently divided into two or three good Farms. Any Person inclining to purchase, may be shown the Premises, by Mr. Benjamin Davis, near there, and may inquire for farther Particulars of Lewis Morris Ashfield, Attorney at Law, Shrewsbury. The road from Freehold to Cranbury and thence to Princeton went very near to Bethel. This route is depicted in several maps, including an 1781 British war map by Lt. John Hills (available at the American Memory Website). This survey further links the proximity of Andrew Johnston’s mill at Spotswood, New Jersey, to the Indian Town, a contemporary usage of the term (rather than “old Indian Town,” “old Indian plantation,” etc.). The upper road is that which leads from Spotswood, on the north bank of the Manalapan River, and heading westerly. This road is shown in the 1809 Armstrong map of Spotswood, housed at Special Collections, Rutgers University Libraries. This near-contemporary map depicts the road north of the Manalapan leading from Spotswood to Mount’s Mill in present-day Jamesburg, and then crossing a bridge over the Wigwam Brook and continuing off of the map. "Lodged at Mr. Brainerd's, the good missionary among the Indians, and was pleased with his account of the progress of religion among them, though now they are scattered by their land being fraudulently taken from them." Tuesday.-I took a view of the Indian town, and was pleased with the affection of the poor savages to their minister, and his condescension to them. Eight miles from Tennent, New Jersey to the APE exactly matches the eight miles for Rev. Tennent to attend to the Indian mission village, where he could go in the morning and return to his own church by the afternoon. The mission was situated on the road from Englishtown to Cranbury and Princeton, a town visited by Governor Belchor, Samuel Davies, and many other religious notables (not to mention famous American Indians such as Tatamy and Teedyuscung). As to Mr. Hayden’s “assessment” of the 1756 Tennent letter, there is no confusion as to the Indian property near Cranbury sold in 1753 to Andrew Home by Thomas Store and Andrew Woolley, successor to Weequehela. The only confusion that may exist is achieved by deliberate combination of misrepresentation of some facts with the omission of other facts. Tennent’s letter and multiple contemporary references to the Indian Town known as Bethel, are all tied like a neat bow to Lewis Morris Ashfield’s land sale advertisement of 1765, after Brotherton was well-established and the Bethel Indian Town abandoned. The Reverend’s specific mention of five hundred acres mirrors Ashfield’s account of the property; an unusual confluence of descriptive language given the different sources. While a 31.4 acre portion has been recently lost, the Thompson Park Historic Site (28-Mi-243) and the remaining open space of the park and nearby Wigwam Brook yet remain to tell us the story of this very special and very unique place. Grubb Map of Project Area, June, 2007. Ashfield Property is marked A. Note location of Major's Spring. Falconer Tract is the dark area to the east of A.